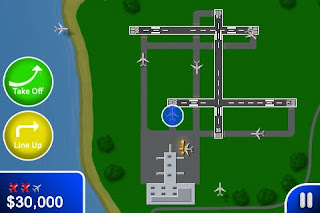 Here are some screenshots from our latest air traffic control game, Airport Madness 3. Our blog platform has changed. For the latest news and release information, check out the new blog on our website. This entry was posted in airport madness 3 on February 25, 2010 by admin. 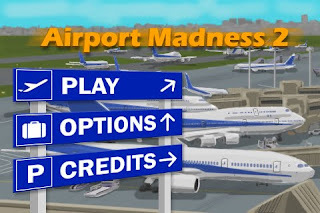 This entry was posted in Airport Madness 2, iphone games on February 11, 2010 by admin. 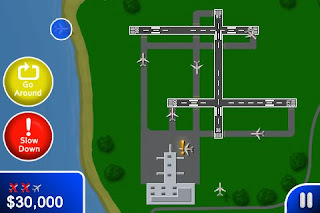 Airport Madness 3 will offer the users a limited ability to assign different runways. As in the real world, there is always some flexibility but there are very few airports that operate in free-for-all fashion. At any airport there are never enough taxiways. Whenever two aircraft stare each other face-to-face on the same taxiway, there is rarely enough room for them to pass, and turnarounds are difficult. It’s not a dangerous situation due to the low speeds involved, but the pilots do have to stomp on their brakes, shut down and call for a tug. Many a real-world controller has inadvertently created this very scenario! And when they do, they are said to earn the “Golden Tow Bar Award”. As much as I would love to give users absolute taxiing freedom, I’m going to keep it realistic. When a 737 calls ready for taxi clearance, you will have the option of assigning a couple of different runways, but there will be a structured flow. For example, by default arrivals will come to you established on final approach for runway 06 or runway 12. You can cross them back and forth between the two runways if you like. Similarly, when a departing aircraft calls for taxi clearance you can taxi them for either runway 06 or runway 12. This maintains a natural flow of traffic. This entry was posted in airport madness 3 on February 6, 2010 by admin. 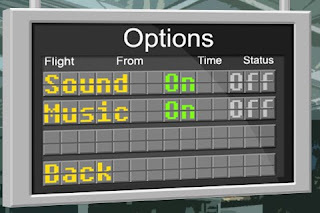 We’ve received a number of requests from people asking, “Can you let me know when Airport Madness 3 is out?”, or “Please email me when the next version of the air traffic control simulation becomes available.”. So we have started a newsletter, something we should have done a year ago. It won’t be spammy, just a friendly email letting you know anytime we have something new out, be it a new game, or bug fix for an existing application. This entry was posted in Uncategorized on February 2, 2010 by admin. Recently we have made several changes to our website. Repeat-visitors may have noticed that the graphics have been updated, but under the hood there have been even greater changes. PayPal has always been a decent eCommerce solution. They are very safe, affordable and reliable. However, we have never liked having our customers whisked away to some far off mysterious payment page. So about a month ago we decided to change eCommerce services. With all due respect to PayPal, we didn’t want our customers feeling like they were buying a pair of used ski bindings on eBay. We wanted something that appeared more professional. Something that would integrate directly into our website, and give customers that secure feeling, “Hey, this seems like a legitimate website to buy from”. The results were a disaster. Overnight our sales dropped drastically. Was this a post-Christmas slump, or a problem with our new service? We gave it a fair trial of two weeks before making the switch back to PayPal. All is normal again. With all of the online fraud we have to deal with today, buyers are reluctant to trust small, obscure websites. So unless you are somebody big like amazon.com, you should use an eCommerce solution that is seriously brand-name, like PayPal. This entry was posted in Uncategorized on February 1, 2010 by admin.